The background and educational requirements to become a legal transcriptionist and a court reporter are different. Although their responsibilities are almost the same, there are some vital differences in the job descriptions of legal transcriptionists, legal secretary, court reporter and transcriptionist. Court reporting is a process of transcribing speech in real time, whereas legal transcription transcribes the recordings. The academic background for court reporting and legal transcription is the same. For a court reporting job, you are required to take academic programs that range from two to four years. The classes include legal terminology and procedures, legal research, medical vocabulary, business law, along with the English language, grammar and mechanics. Certifications granted by court reporter associations are usually accepted by most states, while some states require state-specific licensing before a court reporter can be employed in that state. Stenotype machines are used by court reporters. These machines differ from a normal keyword and contain phonetic code. A person needs to complete a formal certification, degree with specialization in legal transcription to become a legal transcriptionist. Those who have completed two or four year degree in criminal justice, legal or paralegal studies can offer a high level of service in this profession. Experience working as a legal secretary or assistant can give a person the skills and knowledge required to become a legal transcriptionist. There are both organizational and freelance court reporters and legal transcriptionists. 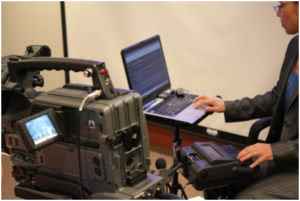 Government agencies, companies and lawyers alike seek out the work of court reporter agencies. The duty of legal transcriptionist is to transcribe recorded depositions, hearings, witness interviews, interrogations, 911 calls, dictations and documents like handwritten letters and notes, affidavits, pleadings and probates. Court reporters attend speeches, meetings, press conferences and seminars to provide professional and quality legal transcription. At RM Reporting, we provide the full suite of reporting services and we are the most professional, cost effective reporting firm to work with in the Rocky Mountain region.